Life is uncertain at best, devastating at worst with numerous stops in between. I seem to be getting this ‘widow’ thing down to a science, when an emotion or a memory will pop up. Now, as the four-year mark approaches, and I stop to consider the 40+ years we shared, four years is but a moment; a heartbeat. I am discovering a parallel between the first four years of marriage and the first four years of widowhood. I walked a tightrope into both situations as I explored the new territory. Both caused me to pause and consider how I came to be in this position. Both of these scenarios involve Love. I journaled my journey this week and found myself with Psalm 63 open in my lap. I read until God spoke, then recognized verses 7 and 8 as meant for my eyes and my heart. Early in my walk with Jesus, verses using the image of being safely tucked in the shadow of His wings, filled the empty places in my heart. Scenes depicting majestic eagles soaring overhead also spoke to me. What a warm and inviting scene this set for my new Believer’s spirit, presenting a vision of protection and safety only a loving Father’s embrace ensures. One day I am bold and courageous and the next I am timid and afraid. The bold happens when I tackle a project I used to view as ‘my husband’s job’, and I succeed. I am courageous on those days when my budget balances, or when friends surround me and someone happens to speak my husband’s name out loud. Timidity and fear make an appearance when I glance back and acknowledge how fast life can take a major turn. I regret things I am missing out on: retirement, financial security, a partner to do things with and the time to do them together. After the first four years of married life, I began to settle in. I no longer feared another woman might steal away my man. I gained a confidence in his love for me and I promised I would never leave him. Life was not easy, but so worth all the work. The years rolled by and life became routine; not boring but comfortable. Widowhood brings so much baggage. The thoughts of ‘what if” and ‘if only’ invade my space and rattle my peace. Memories of the last 77 days with Dave, too often, are the only memories I can bring to mind, at least the most prominent ones. Now, almost four years later, a new sense of calm and security surround me. I scaled many a hurdle I never envisioned I would need to. It is during those days, the words of Paul shine a light on my path. The days we are at our lowest, God lifts us up on Wings of Eagles. Proof of this hangs on the wall in my living room. Dave’s brother, a gifted and talented artist, painted a picture for my husband, delivering when he visited Dave for the last time. 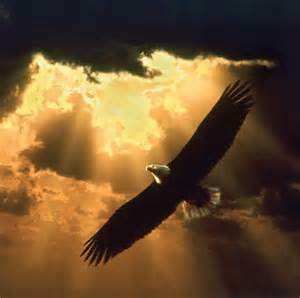 The picture is of an eagle soaring toward Heaven. God is so good.